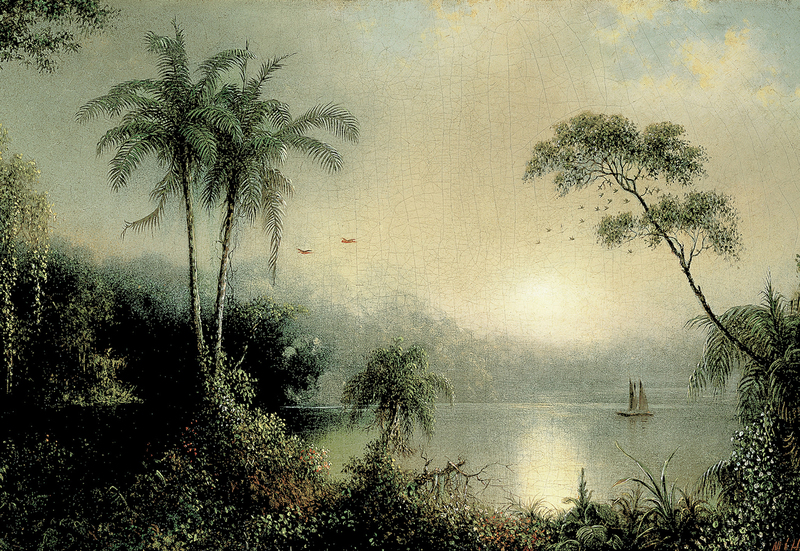 Sunrise in Nicaragua, Martin Johnson Heade, 1869. In 1820, the year of George IV’s accession, there came to London from the Americas, His Serene Highness Gregor the First, Sovereign Prince of the State of Poyais and its Dependencies, and Cacique of the Poyer Nation. He arrived unheralded and without ceremony but, within a few months, his name was to flash like a meteor across the skies of contemporary fame and as rapidly to pass into oblivion. Nine years before, in 1811, a young Scottish adventurer had taken ship to Venezuela at the age of 25 to seek his fortune in the wars of independence fought by the Spanish colonies in Latin America. His name was Gregor MacGregor, and he came of a fighting stock. His grandfather was a famous clansman, named in the Gaelic, Gregor the Beautiful, who became one of the early officers of the Black Watch and, after long years of campaigning, settled down in honourable retirement as the Laird of Inverardine in Breadalbane. These soldierly traditions were carried to Venezuela by his grandson and namesake. A debonair and imperious young man, he possessed a winning personality, a boundless West Highland imagination and a fiery daring that could hardly have been excelled by any of his turbulent clan. Resource and ability were his to an exceptional degree, and also a lack of scruples which transformed his many admirable qualities into a highly mischievous product of human nature. With some years of meritorious service in the British army to commend him, the young Highlander was readily granted a commission by Simón Bolivar. His subsequent career in the Liberator’s service was dazzling. In a very short time, he was posted, with the rank of colonel, to the staff of General Miranda, then Bolivar’s principal commander in the field. It was perhaps significant, in the light of subsequent events, that MacGregor should thus fall under the influence of an older man of forceful and flamboyant personality who was obsessed throughout his life by the dream of founding a new Inca empire in South America. For this, in a modified way, was to remain an inspiration to the imaginative Scot long after Francisco de Miranda, former general in the Grand Army, sometime lover of Catherine the Great, had been taken by the Spaniards and shipped to the prison of La Caracca, in Cadiz, where he spent four years collared and chained to the wall before he found clemency in death. As time went on, Gregor MacGregor distinguished himself again and again by his courage and leadership. The staff colonel became Commandant-General of Cavalry, then General of Brigade and, finally, when he was no more than 30, General of Division in the Army of Venezuela and New Granada. These were his days of glory, resonant with the names of battles – Onoto, Chaguarames, Quebrado-Honde, Alacran. His retreat from Ocumare, through hundreds of miles of jungle in the face of overwhelming hostile forces, was an epic of the campaigns of 1816. In the decisive defeat of the Spaniards at Juncal he played a brilliant part. Bolivar came in person to decorate him with the insignia of the Order of Libertadores, and MacGregor took advantage of his heyday of fame to marry the supreme commander’s niece. Had he fallen in action about this time, he might fittingly have joined the corps d’elite of bronze horsemen riding through time amid fountains and flowers in the plazas of South America, and a great many worthy men and women would have escaped ruin and a ruthless death. 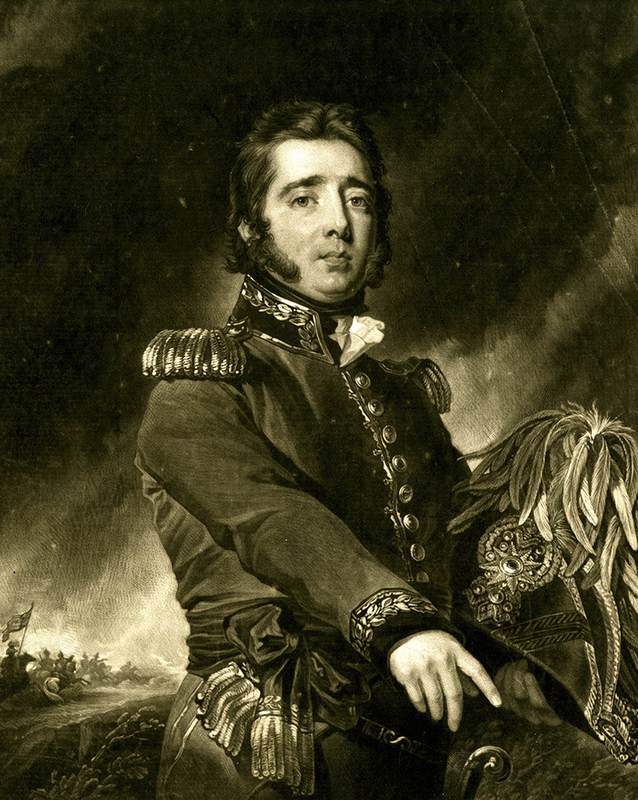 When the Spaniards at last suffered defeat on the Caribbean coasts, MacGregor, thirsty for fresh conquests and impatient of the anticlimax of peace, left Venezuela to carry on a private war of his own. Operating from sequestered bases among the cays, he organised and led many audacious expeditions against surviving Spanish outposts. Thus he attacked and took Porto Bello, the prize of the Isthmus of Panama which had fallen to Morgan and Drake before him. Rib Hacha, one of the old treasure ports of New Granada, surrendered to his landing parties and, by a surprise attack with only two small craft and 150 men, he reduced the powerful fortress on Amelia Island, a strategic key-point commanding the shipping routes in the approaches to Florida. It did not mean that these conquests were short-lived. Long before the avenging arm of Spain could reach him, his brigs and schooners were off and away, inflicting an unexpected blow elsewhere. 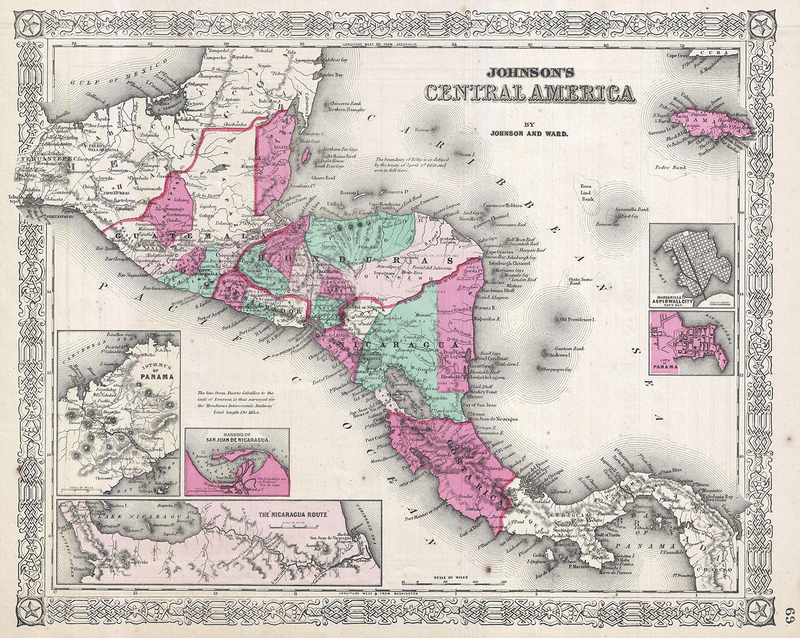 Johnson's Central America, 1864. The Mosquito Coast roughly corresponds with the eastern coast of Nicaragua, starting in southern Honduras. Then, in the spring of 1820, he landed with a few of his associates upon the mainland of Nicaragua where the low Atlantic seaboard stretches due north and south in an almost unbroken line. This was the region known as the Mosquito Coast: a swampy, pest-ridden littoral inhabited only by wandering tribes of Mosquito Indians. In the 17th century, these shores were the haunt of all the riff-raff of the Main and when, in 1670, certain buccaneer captains established their headquarters on the Coast, the Indians had offered to acknowledge English sovereignty over their country in exchange for protection. Thus the territory became an unremembered English colony administered until 1788 from the vanished settlement of St. Joseph’s; in that year the coast was abandoned and the colonial establishment withdrawn. Deprived of the protection of their government, the few settlers gradually drifted away and, as time passed, the last traces of their habitations were obliterated by the ants and the jungle. This was the place – less hospitable than Crusoe’s island and almost as remote – where MacGregor arrived in 1820 with a plan for re-colonisation. Having apparently persuaded the aged Indian ruler to grant him a wholesale concession of territory, he left immediately for England to promote an extravagant enterprise. His sovereignty and title as Prince of Poyais – as he named his newfound dominion – were assumed en route and, with a dream of empire taking shape in his mind, he arrived in London in search of funds and subjects. He came to a land where the times were auspicious for imposters. Two decades of continental warfare had impoverished and exhausted the country, and men were ready to follow any lure of fortune that promised escape from the bleakness of the post-war world. Perhaps it was because of this that MacGregor’s forceful and engaging personality so easily impressed the London of 1820. Reports of his brilliant career in the Central American wars had preceded him and soon he had the world at his feet, listening to the story he had to tell. Then, like a herald of lost Atlantis, he unfolded pictures of a land fairy-like and fabulous. Poyais was a paradise where, in an atmosphere of perpetual summer, the fertile earth produced all the needs of man with hardly any occasion for labour. From majestic mountains, clothed with forests of redwood, cedar and mahogany, noble rivers flowed down to the sea over sands of virgin gold. There was gold, too, in those mountains – shining outcrops from which any man might pick a fortune with a hand-axe – and precious stones could be gathered like gravel from the hillsides. Leafy roadways traversed the country between plantations of sugar, coffee, cotton and indigo. Vast herds fattened on the prairies, the rarest fruits grew wild in profusion and exquisite birds flashed by in the sunlight. It was as though all the Utopian dreams of mankind had come true. Near the mouth of a broad river spanned by splendid bridges, the capital city of the Poyaisian State looked eastward towards the Atlantic. The domes and colonnades of stately-buildings flanked its tree-lined boulevards – the Royal Palace, the Parliament Buildings, the Opera House and the Cathedral. Mansions, banks and great merchant houses reflected the wealth passing through the warehouses and loading on the quaysides of the port. Here, on occasions of state, His Highness was accustomed to drive in procession, attended by a glittering company of Knights of the Green Cross, whose privilege it was to ride with the sovereign, and escorted by a bodyguard of Poyaisian Lancers, the crack corps of his army. The government was administered by three legislative houses, of which the House of Barons was supreme. Engravings of this mythical metropolis were printed and sold in thousands in the streets of London and Edinburgh. 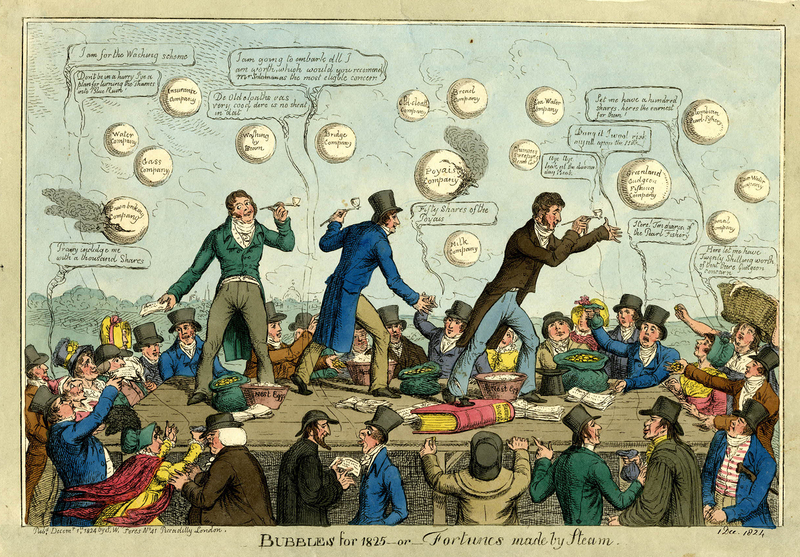 'Bubbles for 1825 - or- fortunes made by steam', Charles Williams, 1824. The 'Poyais Company' is visible in a large bubble in the centre. Those were days of imperfect cartography, and there was room for a hundred Utopias among the empty spaces on the maps. Since it took a ship weeks, sometimes months, to make a transatlantic crossing, it was often difficult to check the accuracy of far-fetched tales of travel. Despite this, the extent of the imposture by which Gregor MacGregor ensnared Londoners seems extraordinary. Pinnacle was set above pinnacle, until the very dimensions of the monstrous fabrication silenced doubt. Who, for instance, could question the discernment of the august Court of St. James’s when, in formal Letters of Credence, 'WE, GREGOR' extended the greeting of a brother sovereign to King George and appointed 'William John Richardson, Commander of the Most Illustrious Order of the Green Cross, Major in Our Regiment of Horse Guards, to be Our Charge d’Affaires in the United Kingdom of Great Britain'? After that diplomatic masterstroke who, indeed, could say that there was no such place as Poyais? Before long, the story was being broadcast by every available means. Pamphlets and books were printed. Offices were opened in London and Edinburgh where land in Poyais was sold over the counter at four shillings an acre. Thomas Strangeways, Captain in the Native Poyer Regiment and Aide-de-Camp to His Highness, produced a masterly handbook and guide to the Mosquito Shore for the use of prospective colonists. Applications poured in from all quarters and business flourished, as hired ballad singers chanted the glories of Poyais upon the pavements and the Prince and his retinue graciously toured the country. On 10 September 1822, the first party of 50 settlers sailed from Leith on the ship Honduras Packet. Most of them were men and women of mature years and modest substance – sturdy farmers and their families who, a day or two before, had halted on the brows of heathery hills to look back on their deserted crofts in the glens; artisans and tradespeople who had sold up their businesses and shuttered their shops; and a sprinkling of professional men upon whom Prince Gregor had bestowed appointments as state officials. There, in uniform coat and kerseymere breeches, stood Lieutenant-Colonel Hall, proceeding overseas to take up the important office of Chief of the Civil Department. 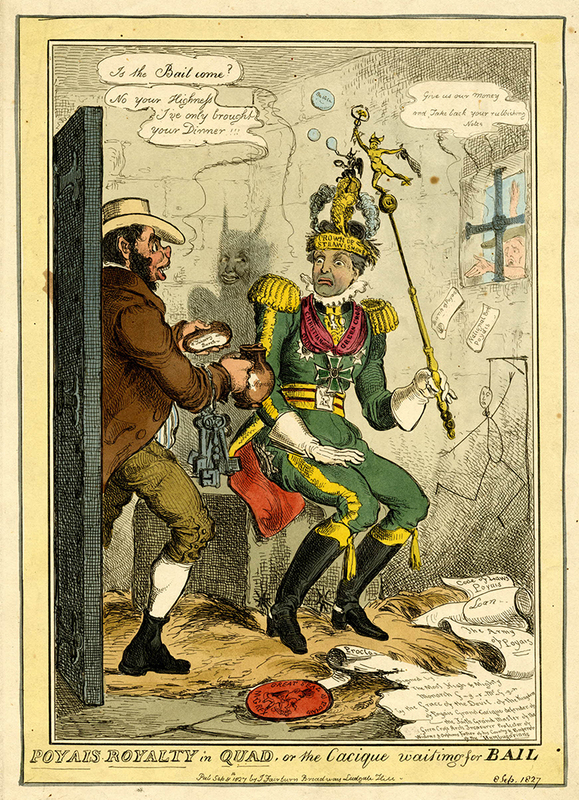 There, flushed with enthusiasm, was young Mr. Andrew Picken, for whom a word of recommendation in an influential quarter had procured a clerkship in the same department, with the promise of a cornetcy in the Poyaisian Lancers if he should wish to exchange into military service later on. For their greater convenience upon landing, they had exchanged their honest Scottish coin for notes payable at the Bank of Poyais, of which some 70,000 had been printed in Edinburgh. Now they followed their belongings into the boats and were rowed out to the waiting ship. Presently, with anchors awash, the vessel came alive and the green-crossed standard of Poyais dipped from her foremast halyards in response to farewell cheers. Eager, hopeful and completely unsuspecting, the little band of pioneers sailed out into the misty firth and followed their mirage westward to the swamps of Nicaragua. 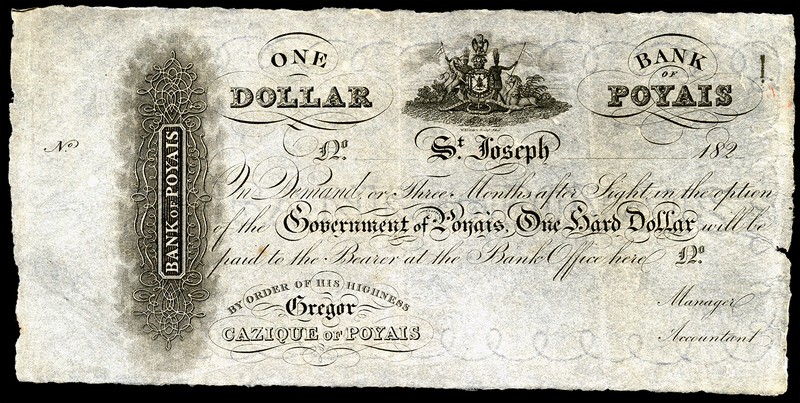 A Bank of Poyais dollar, printed in Scotland. The snowball of deception set rolling by MacGregor had now gathered unmanageable speed and proportions. With further sailings to be organised and financed, soaring expenses to be met and an expanding army of agents and functionaries to be rewarded, the Prince found himself short of funds. He accordingly approached the banking house of Perring & Company at No. 72, Cornhill, in the City of London, with a proposal for the flotation of a loan to his government. Its principal, Sir John Perring, was a former Lord Mayor and one of the City’s most experienced men of affairs. It is strange that his shrewd wits failed to detect the swindle. But, as the banker may have reasoned, here was a man whose claims were admitted in the highest quarters, whose address and bearing supported him in every particular, whose agents were everywhere and whose ships were even now on the high seas, conveying persons of quality and repute to eminent positions in his service. And, of course, there would be some profitable underwriting and handsome fees accruing to the issuing house. Sir John went the way of the rest and, early in the year 1823, his company sponsored a loan of £200,000 at the issue price of 80 per cent, secured upon the general resources of the State of Poyais. The issue was a notable success. Stockholders were granted the option of exchanging their bonds at any time for freehold land in Poyais of an equivalent value, and thousands rushed to take up the scrip. For MacGregor, nothing could go awry. Meanwhile, the Honduras Packet had reached the Mosquito Coast. On the decks, excited emigrants, attired for landing in their best coats, gowns and bonnets, strained their eyes for a first glimpse of the towers and spires of the Poyaisian capital. The ship anchored off the bar and fired a gun, waiting for port authorities and pilot. The wait was in vain. The passengers found themselves upon an uninhabited shore, shimmering in heat, silent and menacing. Believing themselves to be merely astray, they disembarked and commenced unloading their stores and belongings while some of the men set off into the interior to find the city. To complicate matters, another vessel arrived from Scotland bringing 150 men, women and children who, with the first contingent, made upwards of 200 people. News of their predicament eventually reached the British colony of Honduras, 500 miles north, and General Edward Codd, the Governor, at once despatched a schooner to their assistance, while the British population of Belize prepared to receive and nurse the sick. Several were already dead, but the survivors were rescued in relays and brought to the colony. Even then, the total mortality exceeded two-thirds of the original number. And this was only the beginning. Other shiploads were on the way, and steps had to be taken by the authorities in Honduras to intercept and warn the newcomers before they were cast ashore. Indeed, during the greater part of the ensuing year, the colonial administration had its hands full with the problems of succouring and repatriating the victims of this gigantic hoax. In all, seven emigrant ships sailed from various ports in the British Isles for that sinister coast of disillusion. While this was going on, MacGregor and his entourage had quietly transferred themselves to France, where they seem to have been equally successful in deluding the public. By 1825, a number of companies had been formed in Paris for the purpose of exploiting the riches of Poyais. In September of that year, a French expedition sailed from Le Havre. Moreover, operating from the security of his new Parisian headquarters, the Prince contracted with the London financial house of Thomas Jenkins & Company, of 39, Lothbury, for the issue of a further Poyais loan for £300,000, secured upon the revenues of the imaginary gold mines of Paulaza. There must have been many who knew the truth by this time, but it is recorded in the chronicles of the Stock Exchange that great excitement attended the flotation and that many rash investors bought the stock. MacGregor remained on the Continent until 1827 when for some reason – possibly because he found Paris too hot to hold him – he returned to London. He was promptly arrested and imprisoned in Tothill Fields. But his amazing luck held good. He may have had friends at court, or perhaps greater names than his were involved. Whatever the reason, the damning case against him was dropped and he was shortly set free. He wasted no time in returning to Paris where baffled justice received a sop by his confinement for a brief period in the prison of La Force. Again restored to liberty, he seems to have lived quietly in France for several years on what remained of his plunder. But by now this was not considerable. Many others had shared the spoils, and vast sums had been squandered in the extravaganza of royal state which he had maintained for so long, and in chartering and fitting out the emigrant ships to Nicaragua. By 1839, his money and friends had gone, and he appealed to the Venezuelan Government for naturalisation and restoration to his former military rank, submitting a statement of his services in the War of Independence under Bolivar and a memorial of his subsequent misfortunes. His old comrade, General Carlos Soublette, who had shared with him the perils of the famous march from Ocumare, was prominent among the leaders of the Republic, and his request was granted. He set out forthwith for Venezuela where he was reinstated in the rank of General of Division and awarded a pension. There is no moral to this story. Indeed, there could scarcely be a more unmoral tale, for it makes game of all rightful beliefs in the rewards of virtue and the retribution which befalls the evil-doer. Gregor MacGregor’s star had never failed him. The wheel had swung full circle and had brought him back to the service to which he had pledged his mercenary sword 28 years before. A career which, with no miscarriage of justice, might have ended under the dark walls of Newgate came to a close instead in the sunlight of Caracas, where, in 1845, he died at the age of 59, leaving a name honoured, at least, in the rolls of the Army of Venezuela. This article originally appeared in the January 1952 issue of History Today with the title 'The Prince of Poyais'.